Half Rack Vs Full Rack – What’s the difference? Super Power Rack – Worth It? Marcy Roman Chair – Is It Worth Your Money? Recently I was introduced to the world of trampoline exercises. Yes, you read that right – trampolines. The same things that kids enjoy jumping around on for fun. Adults can now do entire fitness routines on these devices, some of which are specially made to support the additional weight of an adult, as well as the types of exercises that are completed on them. Here, I’m going to examine several different types of them in order to determine which ones are the best fitness trampolines. A fitness trampoline is a piece of exercise equipment. You can place it in your home gym, as long as you have enough ceiling height to do full bounces and other exercises. These trampolines are built to hold a grown adult’s weight, and usually, have a weight limit of around 300 pounds. They are far removed from the trampolines that kids jump on. Those are designed to hold children, who weigh much less than adults, and they come in a number of different sizes. These kid-sized trampolines are closer to the ground as well. While you can use a full-sized trampoline (the kind that takes up quite a bit of square footage and must be placed outdoors in a backyard), you’re much better off doing your workout on a special fitness trampoline. The large backyard kind look nice, but you have less control over your movements, due to their size, and you’re more likely to hurt yourself while doing your exercises. Now, I’m going to go into some detail about what you need to look for when shopping for the best fitness trampoline for your needs. What Should You Look For In The Best Fitness Trampolines? The best fitness trampolines are small and designed for one person. Before you purchase one, you’ll need to go examine it closely. Look at how much weight the trampoline can hold. You need to ensure that you can do your exercises on it without breaking it (and hurting yourself in the process.) The best fitness trampolines have metal frames that are extremely stable. They also should have durable surface material, and either very strong metal springs or elastic bands. Make sure that the overall diameter of the jumping surface is something that you’re comfortable with. The sizes vary quite a bit but remain on the small size, and you don’t want one that you’ll accidentally jump off of mid-workout. These are your typical fitness trampolines. They are small in diameter and come with all of the features that you need in order to complete your exercises regularly. They have sturdy metal frames, metal springs (or elastic bands), and their surfaces are very durable. Some might come with those additional features, but they might not. Rebounders trampolines are designed to throw you up into the air at a greater height than the standard variety. They’re designed for people who do exercises that require them to be in the air for a longer period of time. Many people start with a standard model and then work their way to adding rebounders to their home gym. Folding fitness trampolines are much like the other two. They can have all of the features of the standard type, or be rebounders. However, once you’re done with your exercises, you can fold them up and store them safely in the corner of your home gym. If you have limited space, or don’t do trampoline workouts all that often, then a folding one is quite handy. The best fitness trampolines fit into one of these three categories. What Exercises Can Be Done On Fitness Trampolines? For this exercise, you start by standing on the trampoline with your feet around six inches apart. Bend your arms and keep your elbows in while bouncing up and down on the trampoline. Keep your knees slightly bent and make sure that you come up off of the trampoline by approximately six inches every time. Do around 30 reps. This exercise is great for burning calories, improving your cardio function, and strengthening your leg muscles. Again, stand on the trampoline with your feet roughly six inches apart. Place your hands on your hips and bend your knees. As you bounce on the balls of your feet, alternately lift your right leg and then your left. (Essentially, you want to do one leg per bounce, switching them each time.) Do an even number of these, such as 30 with your right leg and 30 with your left, in each session. This exercise also helps your cardio fitness, while working on your leg muscles. Yes, you can do squats on a trampoline. The starting position for this exercise is with your feet together and your arms straight down at your sides. When you bounce, you want to get your body in a squatting position, with your knees bent and your legs apart, as if you were sitting in a chair. Your arms should be straight out in front of you. Land in this position, and then gently bounce back to the starting position. Repeat this around 30 times per session. These are some very basic exercises that can be done on all of the best fitness trampolines. The MaXimus Pro Gym Rebounder is on my list of the best fitness trampolines because it is a professional model with a low slip surface. This trampoline comes with the Advantage Large Spring System, which provides a very low impact bouncing sensation. Its foldable legs make it easy to store, and since the legs are spring-loaded, the entire exercise device can handle quite a bit of weight. It also comes with a stability bar. Since this is a rebounder model, you’ll find that you can gain quite a bit of air with it. The MaXimus Pro has a 40-inch diameter and weighs a mere 28 pounds. 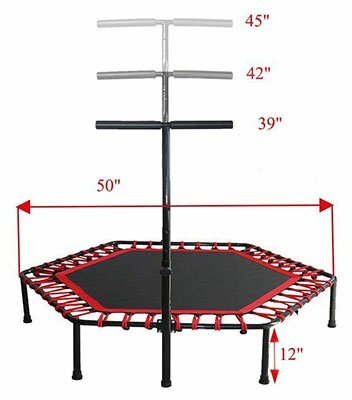 I’ve placed the EFITMENT 45-inch Fitness Trampoline Rebounder on my list of the best fitness trampolines because it comes with an attached handlebar and is quite sturdy. 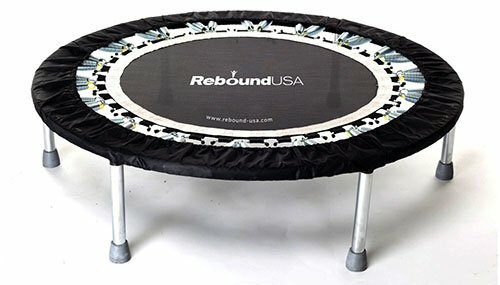 The EFITMENT 45-inch Fitness Trampoline Rebounder has a 44-inch diameter. Thanks to the attached non-slip, adjustable handlebar (which is removable), it measures 49-inches high. This exercise device is built to last, and its jumping surface is made of high-density polypropylene. 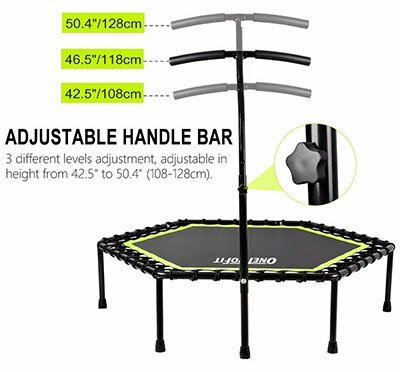 The frame has 32 heavy duty resistance grips, ensuring that this trampoline can support upwards of 220 pounds. If you need to clean it, just use a damp towel –no other cleaning solutions necessary. 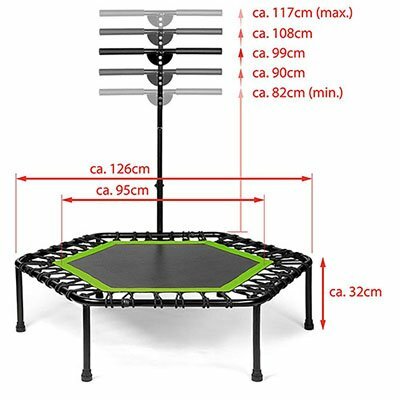 The SportPlus Silent Fitness Mini Trampoline is on my list of the best fitness trampolines because it’s built with a unique bungee system that allows it to support up to 286 pounds. 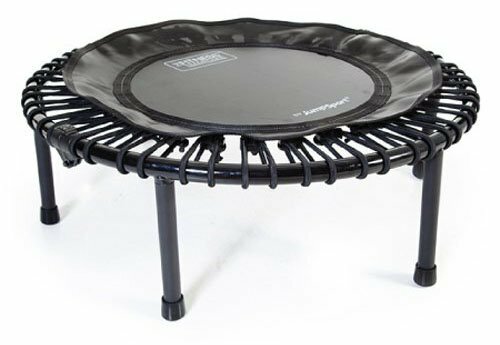 The SportPlus Silent Mini Trampoline comes in black with your choice of three different accents colors: red, green, and blue. 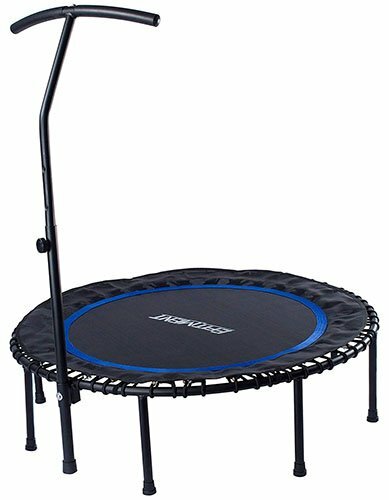 It comes with an adjustable handrail and is considered to be a rebounder trampoline, although you do have more control over the amount of the bounce that you receive with this model. It’s considered to be an indoor trampoline, even though it has a 44-inch diameter. The legs have rubber feet, and thanks to its bungee cord design, it’s very quiet when you bounce on it. 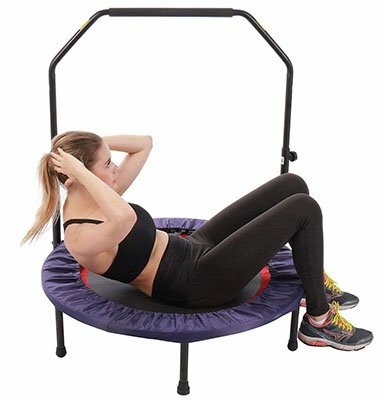 The Marcy Trampoline Cardio Trainer With Handle is one of the best fitness trampolines because it’s incredibly light and portable. It also has a slightly adjustable handle. If you want a trampoline for your home gym, but don’t have a lot of space, then you’ll like the Marcy Trampoline Cardio Trainer With Handle. It measures 26 inches in diameter by 16 inches by five inches and weighs a mere 26 pounds. It also folds up for handy storage. Despite its small size, this trampoline is very sturdy and can support up to 250 pounds. 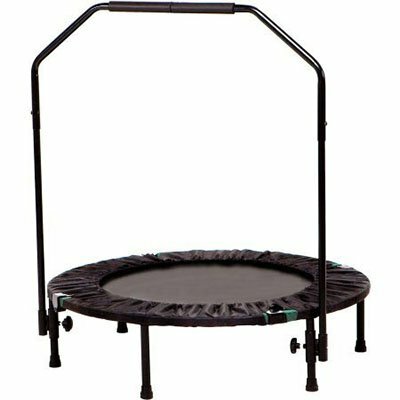 It’s perfect for someone who is just beginning their trampoline fitness routines. The Safly Zone Mini Trampoline is one of the more unique pieces of equipment on my best fitness trampoline list because it’s shaped like a hexagon instead of a circle. This doesn’t make it any less useful, however, and it is on my “great trampolines for beginners” list. The Safly Zone Mini Trampoline comes in three different colors: blue, red, and green, all with black accents. It also has a removable handrail. Rather than use springs, the Safly Zone Mini Trampoline has colorful bungee cords that make for a very quiet workout. It measures 50 inches in diameter and can support up to 265 pounds. I’ve placed the OneTwoFit Silent Mini Trampoline on my list of the best fitness trampolines because it has good elasticity and a stable structural design. You won’t have to worry about breaking this one by bouncing too forcefully on it. The OneTwoFit Silent Mini Trampoline comes in a striking black and yellow color combination. It has an adjustable handle that’s coated in foam for a comfortable grip. The foam will also protect you, should you accidentally run into it mid-bounce. This trampoline uses a bungee cord system instead of springs and can support an amazing 330 pounds. It also has anti-slip pads, a very sturdy metal frame, and is 48 inches in diameter. The PLENY 38” Mini Fitness Trampoline made my list of the best fitness trampolines because it lives up to its name. 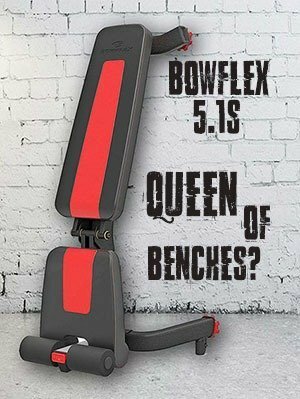 It is much smaller than most other models, making it the perfect size for a home gym. This trampoline is both small and durable. It can handle up to 300 pounds and is only 38 inches in diameter. It comes with a stability bar, which adjusts but isn’t removable. The trampoline is built with a longer screw thread than similar models, adding to its durability. It also has a tight jumping mat and a sturdy metal frame. GarageGymPro.com is a participant in the Amazon Services LLC Associates Program, an affiliate advertising program designed to provide a means for sites to earn advertising fees by advertising and linking to amazon.com.